Free Online Collage Maker | Lucidpress . ', failHtml: "
Turn your photos into something everyone will want to see. Lucidpress's free collage maker provides designers & non-designers with the tools to create stunning photo collages that tell a story that's as beautiful as your images. New to design? Grab our tips on how to make a collage below. With Lucidpress, there's no need to spend time trying to line everything up. Our selection of free templates gives you a running start with some aesthetically pleasing layouts—and with our intuitive interface, you can follow your artistic impulses without any roadblocks. 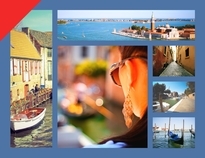 Take your photo collage to the next level with Lucidpress. Our gallery holds hundreds of professionally designed templates for any occasion. 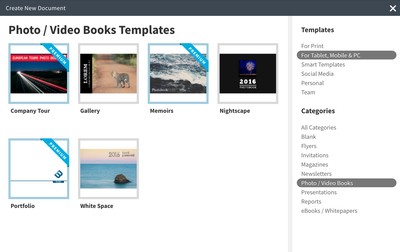 Look through our library of templates to find the right one for you, then customize it to fit your needs. You can start using our collage maker online without signing up with a credit card or waiting for it to download. Lucidpress is ready to use right away. All you need is a current email address to begin. Since Lucidpress is online, you can work from any computer and have the same program available to you. We also regularly deliver updates to our editor that you'll never have to pay for or download. You can focus on making a beautiful finished collage of photos and let us worry about the rest. Work together with your team or friends as you put together your photos. Whether it's for a presentation, a Facebook post, or a scrapbook of photos from your latest trip, the real-time collaboration takes out any confusion that can come from working with others. Lucidpress has everything you need, without the extra clutter. The drag-and-drop interface makes it simple to put together photos and text in an appealing way. Each feature is clearly laid out in the editor, and support is just an email away. 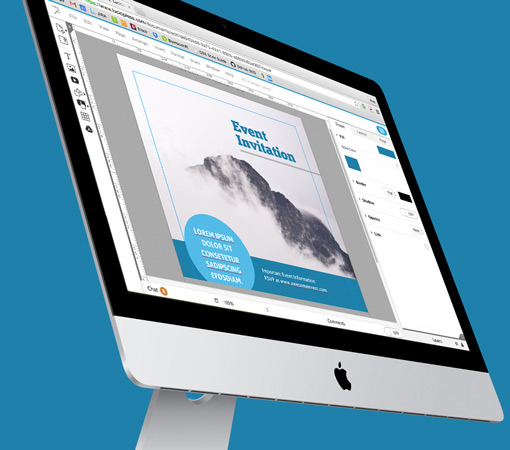 Create your own masterpiece using one of our templates, or start from scratch. 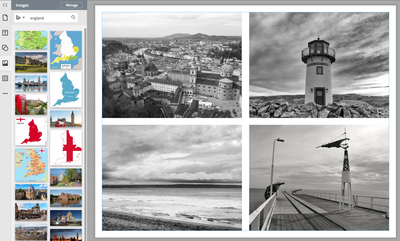 Whichever way you decide, you can easily change the layout & design of your photo collage to make it your own. Now that you've completed your photo collage, there are so many ways you can share it through Lucidpress. We'll give you a unique published URL that you can share, or you can download the photo collage to your computer to save it. Choose from any of Lucidpress's professionally designed photo layouts to start using our photo collage maker. If you would like to start from scratch, then open a blank canvas and select your desired size. Once you've created your document, you can select background colors and decide whether to add any borders to your collage. Click on the Image Manager (or the picture icon on the left side of your screen) to open your image folder. 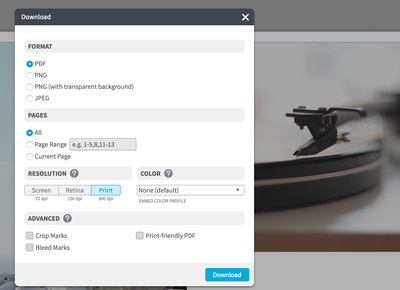 Click Upload to select the type of file you'd like to add to your Lucidpress account. 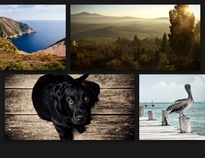 Select the photos you'd like to use from your computer, then click Choose. Your photos will appear in your Image Manager window, and you can start inserting your photos into the collage from there. With your images handy in the Image Manager, and with Lucidpress's robust design features, you can create a perfect collage for your photos. Add any graphics or shapes to your collage using the left vertical toolbar to access the Bing Image Finder or the shapes library. 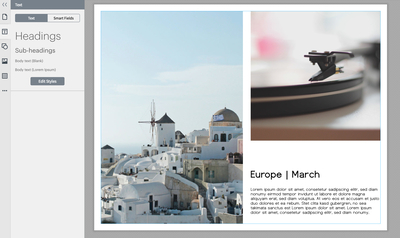 You can also pick the a color scheme that complements your images and background, on the right-hand side of the editor. Next, choose from the dozens of stylistic fonts available to add text to your photo collage. Do you have a video that goes perfectly with your images? You can add that to your photo collage, too, by clicking on Buttons, Videos, & Scroll Areas at the bottom of the left vertical toolbar. Simply link to your video on Youtube or Vimeo to have your video play right next to your pictures. The combination of photos, background, colors, text and even video will lead to an impressive result. Now that you've finished creating your photo collage, you can publish the document through Lucidpress, download it to your computer or print it through Lucidpress's Print & Ship feature. If you want to gather feedback before you publish the collage, you can easily share your document with your friends. Collaboration is instant—no emails or PDFs necessary. Just invite your colleagues to view, edit or comment directly in the document. Once you’re ready to share, you can get busy printing or posting on social media platforms like Instagram & Facebook. 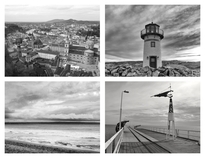 Bring your pictures to life by creating an engaging photo collage. Lucidpress's picture collage maker is the tool you need to easily make a stunning design that will show off your photos. 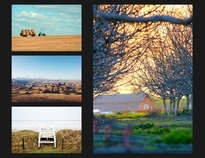 Check out our full template gallery and select from the layouts to get going.